The iBus on route 107 was changed from "to New Barnet" to "to New Barnet Station" 6 months ago, but this was only temporary and quickly reverted back to the original announcement. I recall travelling on a 107 many months ago where the iBus displayed something along the lines of "107 to New Barnet, Great North Road". This isn't an official curtailment, and according to the LVF, the driver and the blinds, the bus was still running all the way through to New Barnet. There was no announcement for this display of destination. I also recall that "79 to Edgware Station" used to simply be "to Edgware" like all the other Edgware routes. I know it was changed to be more specific, but why one route and not all the others? Why do TfL insist on changing the iBus of some routes to add "station" etc, but not others eg the 107? What data did they collect from the trials of different ways of putting the destination, and how did they know that "New Barnet" was more favourable than "New Barnet Station"; there was no consultation or survey on the bus etc?? In Brixton, we have the baffling situation where the P4 has Brixton Station as it’s I-Bus destination but other terminating routes just have Brixton despite terminating in the same place. It’s a similar story with blinds as well. iBus/MDT not always works perfectly, even in curtailment situations half of the time it does not actually make the iBus change the destination announcement, it just keeps saying the final destination regardless and people will usually get confused because they'll look at blinds, see it's not going all the way to the end, yet when in bus, the iBus still calling out final destination. Drivers keep pressing on curtailment and it just doesn't work. Also in most cases people don't even look at the destination on the blind, even if the bus is turned from first stop with different blind, people just look at shape of bus, number...get on and then get 'surprised' as when driver announces 'the bus is terminating here' and they just sit there like what has just happened. Yes I agree. Curtailments on the iBus, countdown and blinds need to be more consistent so everyone, drivers and passengers, get the correct information to assist them in making the journey as smooth as possible. Efficient communication between the iBus team/drivers/passengers etc is also key here in minimising confusion. I feel TfL could really improve the versatility of the iBus/passenger information system, and link it to information already available from the TfL website or Bus Alerts Twitter account for things such as scheduled bus stop closures, temporary route changes, etc. 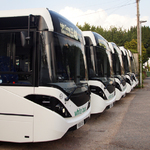 For example, if a diversion is planned in advance and published on the website, instead of passengers having to click every date in the calendar one by one to see if there happens to be a diversion on a particular day, have a scrolling message on the iBus onboard and countdown screens a few days before, detailing what's happening! The reality is that most people do not plan their regular journeys everyday and are caught unaware when something like a diversion happens, only realising when they are on the bus/at the bus stop, then it's already too late. This is both annoying and frustrating; having the correct information through the correct channels would enable passengers to plan an alternative journey or allow extra time etc. Lastly, I think TfL should transfer the information currently published on those little yellow diversion notices stuck to bus stop timetables to the iBus countdown and onboard screens. Most people don't even look at the timetable anymore and miss the little notices, then get annoyed when their bus never turns up! Fully agree, as cheap resort they should at least add pre-recorded announcement warning people of potential delays/planned diversion on the route due to road works or whatever and make them check tfl website for news on it. But instead drivers get new announcements like 'this bus is ready to depart' which I fail to see when would a driver use it. 'New Barnet, Great North Road' is a official turn, replaced 'Barnet Odeon' due to the change in ownership of the cinema. I find it very confusing however they went with New Barnet seeing as its one bus stop after High Barnet Station. The 79 conundrum still exists - RATP's new blinds use 'Edgware Station' for 79 and 'Edgware' for the rest as you said. It's just one of the many discrepancies and inconsistencies in TFL's destination list. When Doug Rose took over typesetting the blinds, I had hoped it would make everything the same but apparently not! TfL do appear to change iBus descriptors at the drop of a hat too - what was originally South Ruislip, Black Bull went on iBus as just 'South Ruislip' but a few months later became 'South Ruislip, Ruislip Manor' which I needn't remind you is two different places! I'm sure 309's still show Bethnal Green Chest hospital even though it hasn't been there for four years and they have had new blind sets but ibus says Bethnal Green .